Hello! If you are searching for unique destination wedding save the dates, invitations and accessories then you have found the right place. We are offering our most popular designs on our Etsy shop. Below are some featured items that you can click through to our shop to view more details, pricing and order. If you are in search of design service, click on our graphic design tab to view samples of our work. This design is really where it all started. A simply cute way of inviting guests to a destination wedding. A play on the idea of being whisked away by receiving a passport and boarding pass, personalized with the couple’s photo on the inside. Click here to view the listing on Etsy. 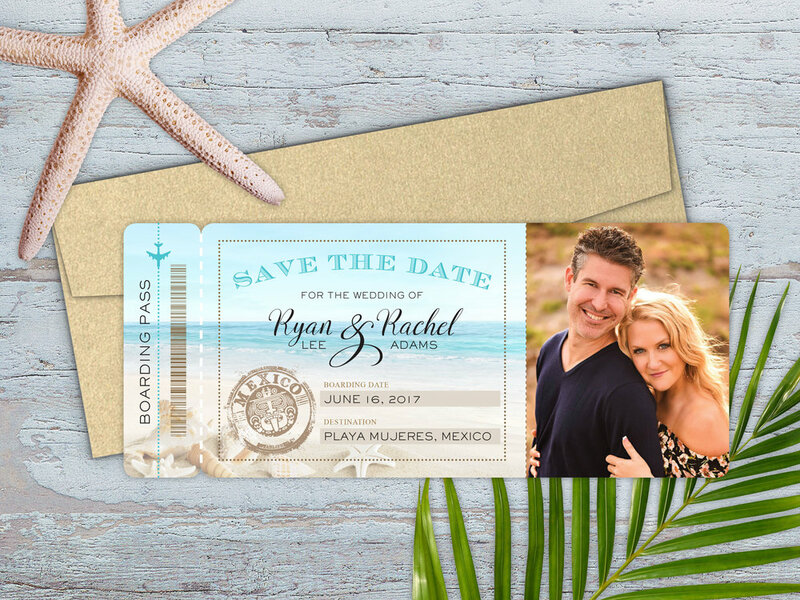 A sure way to get guests excited about your destination wedding is to send a boarding pass save the date. Not only does it let them know when they should be ready for travel but you can customize it with your destination and a nice photo of you two! You can also choose to make this a magnet so guests can place it on their fridge or other magnet receptive surface. View the listing on Etsy. Sometimes simple and elegant is the way to go. You can play on the theme of your destination in a subtle way that still gets guests equally as excited to jet set off to your wedding. View the listing on Esty.